Champuru or Chanpuru is considered a mainstay dish of Okinawan cuisine. 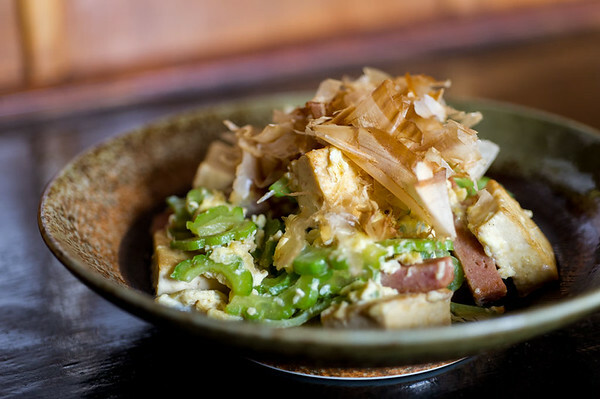 It is a stir fry of tofu, egg, and pretty much whatever you want (Pork/Spam, Nabera, Moyashi, Fuu, etc). The most famous is Goya (bittermelon) Champuru. 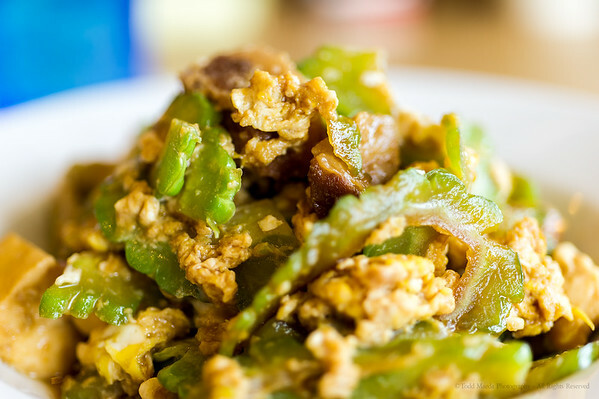 Here’s a comparison of Goya Champuru dishes in Hawaii. Love how different the preparations all are! Note: Posting them alphabetically by restaurant name. Photos by Todd Maeda Photography. 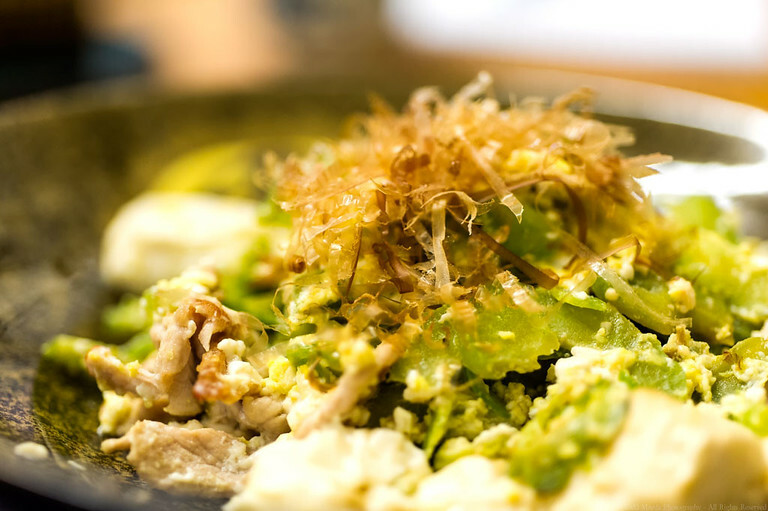 Hide-Chan tops their champuru with katsuobushi flakes (that wave at you!). They generally serve pork but you can opt for Spam. I found the champuru to be a nice combination of flavors, the bitterness of the goya is mitigated by the tofu and egg. I liked that the dish was not oily or heavy. Naru adds in Spam to their champuru, with the option to substitute with bean sprouts. They saute the large pieces of tofu and Spam. Adds in goya, and then sprinkles on salt and sake to mitigate the bitterness. Dashi is added for seasoning. Eggs are added to the dashi, so they end up fluffy. The goya is cut thin. 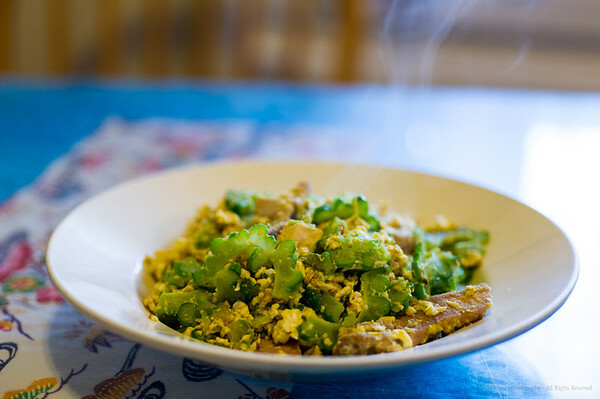 This version has goya, pork, tofu and egg. Spam can be put in upon request. My friend was surprised that the bittermelon in this dish had just a hint of bitterness to it. Katsu said there’s no cooking trick. He just knows which goya to buy. The Chanpuru at Utage is distinctly “wetter” than the other Hawaii Okinawa restaurants. Jocelyn explains the reason is that she tries to avoid having to fry with oil to make the dish less greasy and healthier. Flavors in this dish work well and the portions of goya and rafute are generous. Utage gives option of pork, chicken, spam, bacon, tuna or shoyu pork with their Goya Champuru.